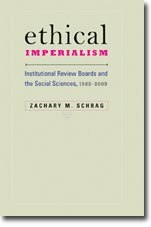 Dominique Rivière, an education researcher at the University of Toronto, reports that REB service left her somewhat less critical of the ethics-review process, but she still calls for significant reform. In particular, Rivière questions the standardized consent process imposed by REBs on all manner of research; she argues that "this particular process of consent does not fully let participants know what they are agreeing to . . ."
She proposes a more open-ended review process. That sounds nice, and it resembles some of the suggestions found in Martin Tolich and Maureen H. Fitzgerald, "If Ethics Committees Were Designed For Ethnography," Journal of Empirical Research on Human Research Ethics 1 (2006): 71-78. But I would have liked Rivière to consider whether the structure of ethics committees and offices dictates their approach to ethics review. First, there is the question of expertise. A committee drawn from across the university will lack deep expertise on many of the proposasl before it. I think this explains some of the reliance on a priori definitions. Second, Rivière hints that it was not the REB but the "research ethics office" that was responsible for much of the delay of her initial project and for asking the wrong questions. Does the rise of IRB and REB staff lead to inappropriate demands on researchers? Third, and most significantly, Rivière suggests a dichonomy between the educative and the regulatory, but she does not ask whether moving from the latter to the former will need structural changes. Sociologists Carol Heimer and JuLeigh Petty have argued--persuasively, I think--that the "bureaucratized research ethics" Rivière dislikes is a product of government policies, organizational interests, and professional self-interest. Unless IRBs and REBs are stripped of some of their coercive power, I wonder if we can expect any serious changes. Can an IRB Ban a Researcher?